The opportunity of inspecting so many pickups over the years has given us a rare and treasured experience, with each of these pickups having their own individual characteristics and unique application. To date, we have restored and fabricated a wide variety of pickups, including vintage pickups now found in highly collectible guitars from the 50’s and 60’s. Perhaps you are not looking to restore a pickup but rather alter an existing pickup detailed to your playing needs. We offer multiple options for you and this modification. Wire gauge, winding count, magnetic gauss, and wax potted or not can all make subtle to drastic changes depending upon the procedure. If you have a pickup that squeals and has microphonic issues, then the general remedy is to have the pickup wax potted. There are a few different formulations of wax that we brew in-house for this purpose. BUILD A PICKUP™ is for you creative minds. 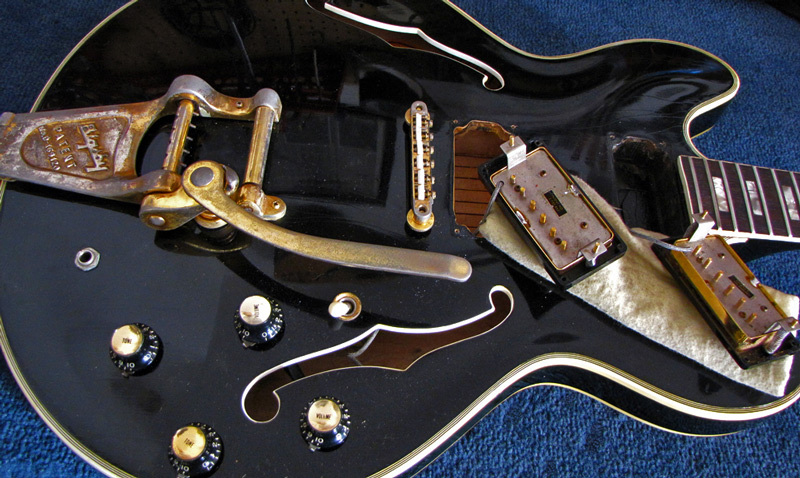 This is a service where we provide you the opportunity to create your own custom pickup from scratch. You pick out the materials and decide the details with us, and we’ll do all the rest. For the finishing touch, you can have your initials engraved into the pickup chassis. Whether it’s a simple repair, modification, major restoration, or BUILD A PICKUP™, we can service your needs.